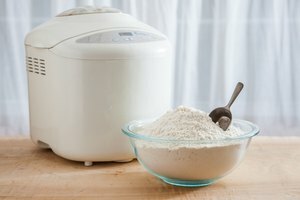 Bread machines are used for making bread, start to finish. 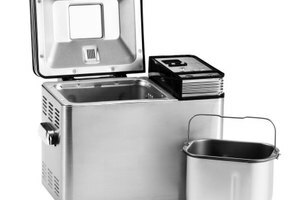 You just add the ingredients to the appliance, and the machine takes care of the rest of the process within a few hours. The machine mixes and kneads the dough, allows it to rise and then bakes it. 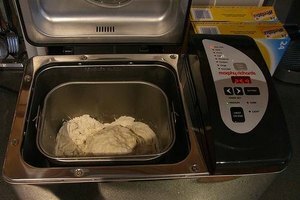 Bread machines are also an excellent way to make dough that can be cooked in an oven. Dough made from a bread machine can be frozen to be used at a later date, or extra spices can be added before it is placed in the oven. Choose a bread recipe or prepackaged bread machine mix. You can use a recipe from a bread machine recipe book, which already has been adjusted for the appliance. Or use a regular bread recipe, and alter the ingredients for use with a bread machine. For a 1 1/2-lb. loaf of bread, reduce the yeast amount to 1 tsp. and use 3 cups of bread flour. 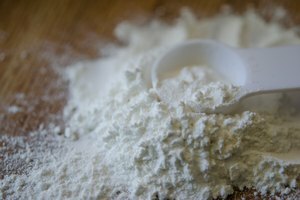 Reduce the other ingredients, using the same proportions as the flour. For example, if your flour was decreased by 1/4, reduce the other ingredients by 1/4 as well. Place the ingredients from your recipe into the bread machine. Any liquids, such as water and milk, should go on the bottom of the bread machine pan. Add butter, eggs, oil and any other liquid ingredients to the pan. Then add any honey, sugar and salt followed by any dry seasonings the recipe uses. Finish by adding the bread flour, then the yeast on the very top of the other ingredients. Set your bread machine to the dough or manual cycle. If it does not have a dough cycle, stop the bread machine before it goes to the baking cycle. Remove the dough from the bread machine when the dough cycle is complete. Place the dough on your floured work surface. Punch the dough down using your hands, while adding flour to the surface of the dough if it sticks to your skin. Knead the dough by folding the outside edges toward the middle. Push down on the dough and fold again. Turn the dough at a 90-degree angle to your body, and repeat the folding process. Knead the dough until it is smooth. Shape your bread into the bread pan you will be using for baking. Place a damp towel over the bread pan, and set it in a warm place. Allow the dough to rise until it has doubled in size, approximately one hour. Bake the bread dough in your oven according to your recipe's instructions. Liquids should not come into contact with the yeast until the bread machine starts mixing the dough.